War canoe trips are a great way for groups of people to feel part of something they can all do together. A trip length should be determined by these general considerations. Active adults can comfortably paddle 12 to 20 miles a day. 9 to 12 year-olds are more at ease with a 4 to 8 mile trip. Wind and currents play an important role on the progress of a trip. Some locations are more prone to these factors than others. We monitor the weather as best we can and will alter plans in favor of safety and comfort. All trips begin with dock or shoreside safety instruction in calm waters before proceeding. Your guide may determine to postpone a trip if experience level or trip conditions deem it necessary. A premiere event in Northwest Native American culture was the potlatch. This celebration always included a feast, trading and games. Ask about our steamed salmon meal and traditional games as possible options for your trip. 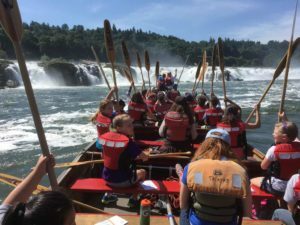 Our 36-passenger war canoe is based on the Willamette river Spring and Fall. It can be located on the Lower Columbia in late July and August. If you want a trip that is different from the base location, a relocation fee will need to be added to the trip price. A 25 person minimum is required to book a trip.